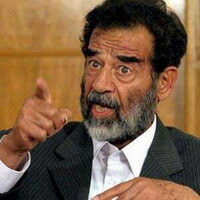 A wealthy Texas oilman is accused of conspiring to pay millions of dollars to Saddam Hussein's regime for lucrative oil contracts. Assistant U.S. Attorney Stephen Miller accused S. Wyatt Jr. , 83, of secretly obtaining oil from Iraq in the 1990s, after Iraq's invasion of Kuwait and the Gulf War led to sanctions that were meant to isolate Iraq from the rest of the world. "When the world imposed sanctions on Iraq, Oscar Wyatt stepped up to help them evade sanctions," Miller said. Wyatt, who could face more than 60 years in prison, has been free on bail since he was charged with conspiring with others to gain favored status for oil contracts by providing money and equipment to the former government of Iraq from 1994 until March 2003. The U.N. oil-for-food program, which ran from 1996 to 2003, was created to help Iraqis cope with U.N. sanctions imposed after Saddam's 1990 invasion of Kuwait. The program allowed the Iraqi government sell oil primarily to buy humanitarian goods. Miller said the oil-for-food program became corrupted in 2000 when Iraqi officials began demanding illegal surcharges in return for contracts to buy Iraqi oil. He said Wyatt used the same contacts he had in the 1990s to pay millions of dollars in illegal surcharges to the Iraqi government that should have gone to the Iraqi people for humanitarian needs. Miller told jurors that two former Iraqi oil officials will be among witnesses at Wyatt's conspiracy trial who will explain how Wyatt managed to get oil when others could not. Defense lawyer Gerald Shargel portrayed Wyatt as a friend and adviser to U.S. presidents who did not break the law. Shargel praised his client as he attacked the corrupt nature of the oil-for-food program, flawed U.S. policy toward Iraq and the dependence of Americans on Middle East oil. "Oscar Wyatt did not pay any surcharge to the Iraqis," Shargell said. "Oscar Wyatt did not break the law." Shargell described Wyatt as a World War II hero who grew up poor but turned an $800 investment in an oil company into one of the largest U.S. oil refinery businesses. He said Wyatt was a friend of President Kennedy, a close friend of fellow Texan President Johnson and was on friendly terms with Presidents Reagan, Nixon and Clinton. "Time and time again, he showed his loyalty to this country," Shargell said. The trial before U.S. District Judge Denny Chin was expected to last four to six weeks. In a pretrial ruling, Chin agreed prosecutors can show jurors evidence that Wyatt encouraged opposition to the 2003 U.S. invasion of Iraq and bragged about his influence to Iraqi officials to win oil contracts.